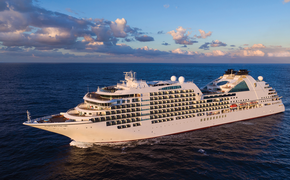 InnerSea Discoveries will operate seven-night adventure cruises in Hawaii by the 76-guest Wilderness Explorer from November 2013 through April 2014. The “AdventureBound Hawaii” cruises between Oahu and the Big Island, visiting Ka’ena Point State Park, Wai’anae Harbor, Maui, Molokini, Lanai, Honomalino Bay, Opihihali and Kailua-Kona. The voyage will also include scenic cruising and searching for whales and dolphins in the Humpback National Marine Sanctuary. Cruise fares start at $2,495 per person, based on double occupancy. The cruises will focus on active adventure, such as snorkeling, skiff tours, kayaking and paddle boarding. A paddleboat carries up to eight people. On board, expedition guides provide interpretation on excursions. Meals are served buffet style. A wellness program includes a sauna, fitness equipment, complimentary yoga on deck and massages for a fee. Cabins feature a flat-screen TV/DVD player, iPod dock and eco-friendly bath amenities. The lounge has games and a library of books and DVDs. For luxury adventures in the Hawaiian Islands, the line’s 36-guest Safari Explorer sails seven-night cruises between Hawaii, the Big Island and Lanai with two days of activities on Molokai. Rates begin at $4,995 per person.